Electric bicycles are having a moment. Major global companies which make cars and motorcycles are suddenly delivering or talking about delivering electric bicycles. What’s going on? 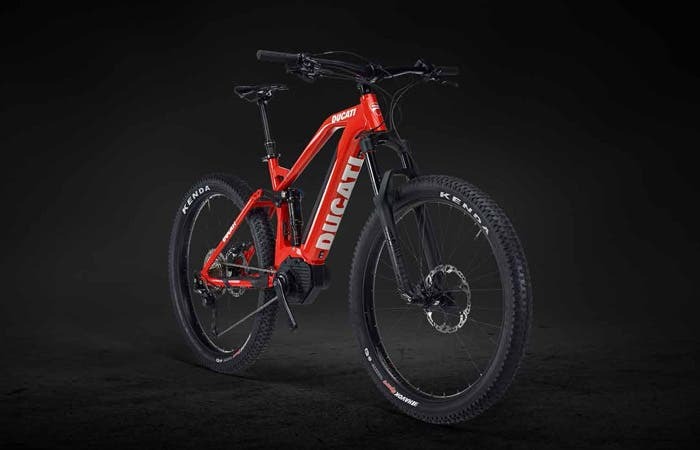 This red beast of a full suspension mountain bike is the top of Ducati’s line of 8 separate electric bicycles. Kitted out with excellent components from top-end bicycle OEMs, it also has a Bosch electric motor to allow it to power up hills. For those who know the brand, Ducati makes lust-inspiring road motorcycles, covering the range from scramblers to naked bikes to sport bikes. They’ve topped podiums globally, appeared in too many movies to name, and in some cases have ended on display in art galleries. But like everyone in the motorcycle business, the company is challenged by global changes and is looking to capitalize on its valuable brand. Likely it was challenged to by its corporate overlords, as the Ducati company was acquired by Audi and hence VW in 2012. And so in 2015 it partnered with Bianchi, another fabled Italian brand, one which has been building racing and road bicycles since 1885. They introduced a Ducati-branded series of bicycles, engineered by Bianchi. Now the company has included electric bicycles for every adult purpose. It’s possible that at this point, Ducati is selling more bicycles with electric motors than it is motorcycles globally. They are certainly at a better price point, while not being cheap by any means, with the pictured TT Evo S roughly a quarter of the price of a Ducati Monster Anniversario edition. And now, Ducati has upped its offroad capability with the announcement of the electric Ducati MIG-RR, built for it by Thok Ebikes, an Italian firm specializing in electrics only. The MIG-RR is closer to 50 lbs than not, but intended for much more serious conditions than the Bianchi trail bikes. People waiting for an electric motorcycle from Ducati might be waiting a long time. But if your urban commute or outdoor play includes bicycles, you can fulfill your electric Ducati aspirations today. Elon Musk had a good 2018, at least in retrospect. Coming out of production hell, Tesla’s Model 3 is now the #1 selling car in the USA by revenue, along with various other signifiers that Tesla is now a real, high-volume car manufacturer. Tesla itself declared a $300 million USD profit for Q3, delighting the stock market and its investors, if not the many shorters who continue to lose money and credibility. SpaceX has landed three separate Falcon 9 rockets on floating autonomous barges in the ocean, bringing the successful launches to 18 for the year and increasing their fleet of reusable rockets. While this set off some excitement among Tesla watchers who also love two-wheelers, it’s much more likely that any e-bike that emerges will be a limited production run, Tesla-branded bike built with one of many great e-bike companies in California. Like the Tesla carbon-fiber surfboard or the Boring Company Flamethrower, it would provide excellent press, be offered at a high price point, sell instantly and be even more good marketing for Tesla. It might be a folder designed for the Model S frunk or other niches on the Model 3 or X. On the other hand, e-bikes are becoming a high-volume, global business and Tesla is well positioned with global retail space, excellent access to batteries, and big factories to get around for its staff. There might be a permanent product in place. Regardless, a dozen e-bike manufacturer CEOs undoubtedly picked up their smart phones and tried to get through to Musk or his execs immediately to offer their services. Like the Bolt, the GM bikes are very much urban-oriented, which as the ongoing CleanTechnica series shows is a strong sweet spot for electric two-wheelers. One thing that leaps out of its contest page is part of its vision for the bike: “Zero crashes.” As a recent CleanTechnica article pointed out, there have been a growing number of injuries and some fatalities associated with electric bikes globally. What GM means by ‘zero crashes’ is unknown, but perhaps it’s more than just an interesting throwaway line in marketing. While GM and Tesla are getting their toes wet, or at least implying that they might, and Ducati is at the table with a serious range of electric bikes, Yamaha is the Japanese entrant to the market. But this isn’t new news. The company has sold over 2 million electric bicycles globally, as well as 4 million drive units. It is a big player in this space and has been since it started. As with Ducati, you can’t buy an electric motorcycle from the motorcycle-heavy brand, but you can power up hills on road and off with one of their motorized products. As the CleanTechnica series has been showing, electric bikes are an increasingly big business, and becoming the dominant form of motorized two-wheel transportation globally. The innovation, design, and money is flowing to electric bicycles much more than motorcycles. This is part and parcel of our increasing urbanization and demographic shifts globally. Electric bikes just make sense. They shorten commutes, they flatten hills, they make groceries and children light, they are fun, and they are clean, silent, and convenient.